The Rockets opened between 1- and 1.5-point favorites at the Thunder, but early betting action pushed the spread to -2 at some sportsbooks. 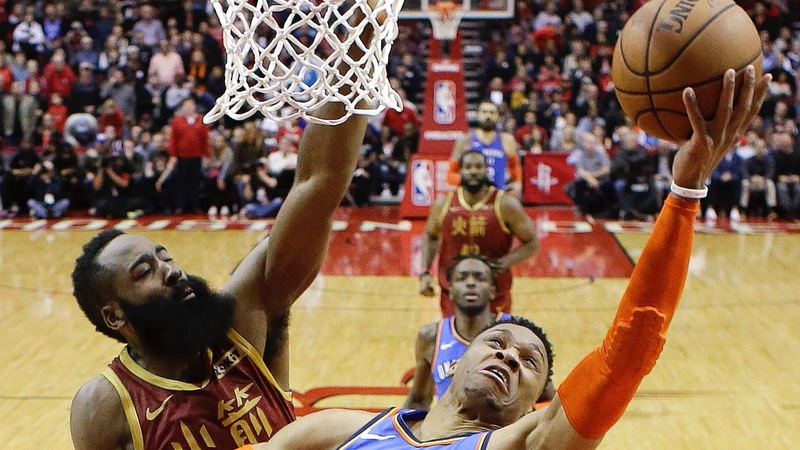 In a game with significant influence on playoff seeding in the West, the Rockets visit the Thunder on Tuesday, the penultimate night of the NBA's 2018-19 regular season. Houston opened between a 1- and 1.5-point favorite, but early betting action pushed the spread to -2 at some sportsbooks. The total was adjusted from 228 to 230.5 in early wagering, and the Rockets are -130 on the moneyline. It's the season finale for the Rockets (53-28, 40-38-3 ATS, 22-18 road, 17-22-1 ATS road), who enter a half-game behind the Nuggets for [second place in the West](https://www.thescore.com/nba/standings). The Thunder (47-33, 40-40 ATS, 26-14 home, 20-20 ATS home) are sixth in the conference, a half-game ahead of the Spurs and Clippers. Should Houston and OKC remain in their respective Nos. 3 and 6 spots, the teams will face each other in the first round of the playoffs. This is the fourth and final meeting of the regular season between the teams, with OKC winning and covering both its home games, and the Rockets winning and covering the first game in Houston. The Rockets have found their stride late in the season, and it's been paying off for bettors. They've won and covered six games in row, and have won eight of their past nine (7-1-1 ATS). Also, Houston's recent 13-2 stretch to the UNDER has been interrupted by a current 3-0-1 OVER run. Should this spread hold, it would mark just the third time this season OKC has been an underdog at home, per some sportsbooks. The Thunder are 2-1 SU and ATS in those spots, and all three games stayed UNDER the total. Let's get to the rest of the busy 11-game Tuesday NBA card, which also includes the Bulls as rare favorites. __MORE:__ [Odds Zion Williamson ends up with Bulls](https://www.betchicago.com/nba-draft-2019-odds-lottery-bulls-zion-williamson) | [NBA win total update](https://www.betchicago.com/nba-win-total-update-thunder-pacers-jazz-grizzlies-schedule) ## Tuesday NBA betting lines, odds, trends *Odds from various sportsbooks; all times Central; ATS records from [TeamRankings.com](https://www.teamrankings.com/nba/trends/ats_trends/?sc=all_games)* ### Hornets at Cavs odds, 6 p.m. CHA: 38-42, 38-40-2 ATS, 13-27 road, 18-22 ATS road CLE: 19-62, 38-42-1 ATS, 13-27 home, 19-21 ATS home __Spread:__ Hornets -7.5 __Total:__ 221.5 __Moneyline:__ Hornets -320, Cavs +260 __Betting tip:__ Charlotte is a game back of Detroit for the final playoff spot in the East and is going down swinging, winning three straight and covering the spread in four straight. Cleveland, meanwhile, [will be without](https://www.cleveland.com/cavs/2019/04/kevin-love-tristan-thompson-matthew-dellavedova-to-miss-cleveland-cavaliers-season-finale.html) Kevin Love, Tristan Thompson and Matthew Dellavedova. Still, this is a big number for the Hornets to lay on the road. ### Grizzlies at Pistons odds, 6 p.m. MEM: 32-48, 37-42-1 ATS, 12-28 road, 16-23-1 ATS road DET: 39-41, 40-38-2 ATS, 25-15 home, 21-18-1 ATS home __Spread:__ Pistons -10 __Total:__ 209.5 __Moneyline:__ Pistons -700, Grizzlies +500 __Betting tip:__ Detroit has failed to cash four games in a row. ### Celtics at Wizards odds, 6 p.m., TNT BOS: 48-33, 37-42-2 ATS, 20-20 road, 17-21-2 ATS road WSH: 32-49, 38-43 ATS, 22-18 home, 23-17 ATS home __Spread:__ Wizards -5 __Total:__ 224 __Moneyline:__ Wizards -210, Celtics +180 __Betting tip:__ The Celtics are locked into the No. 4 seed and thus have little incentive Tuesday in Washington. __Bookmark us:__ [Daily NBA betting coverage](https://www.betchicago.com/nba-betting) ### 76ers at Heat odds, 6:30 p.m. PHI: 50-30, 37-43 ATS, 20-20 road, 17-23 ATS road MIA: 38-42, 42-37-1 ATS, 18-22 home, 16-23-1 ATS home __Spread:__ Heat -4.5 __Total:__ 220.5 __Moneyline:__ Heat -190, 76ers +170 __Betting tip:__ The Sixers are locked into the No. 3 seed, while the Heat will be motivated not only by their still-alive playoff hopes but also because it's Dwyane Wade's [last game in Miami](https://www.miamiherald.com/sports/spt-columns-blogs/dan-le-batard/article228900829.html). ### Knicks at Bulls odds, 7 p.m. NYK: 16-64 (clinched league's worst record), 31-46-3 ATS (worst in league), 7-33 road, 16-23-1 ATS road CHI: 22-58, 35-43-2 ATS, 9-31 home (tied for worst with New York), 14-26 ATS home (worst) __Spread:__ Bulls -1.5 __Total:__ 216.5 __Moneyline:__ Bulls -125, Knicks +105 __Betting tip:__ Chicago is 2-4 ATS this season as a favorite. ### Raptors at Timberwolves odds, 7 p.m. TOR: 57-24, 36-44-1 ATS, 25-15 road, 18-21-1 ATS road MIN: 36-44, 39-41 ATS, 25-15 home, 22-18 ATS home __Spread:__ Raptors -6.5 __Total:__ 229.5 __Moneyline:__ Raptors -270, Timberwolves +230 __Betting tip:__ The Raptors have the No. 2 seed wrapped up, making laying all these points on the road a tough proposition. ### Warriors at Pelicans odds, 7 p.m. GS: 56-24, 35-44-1 ATS, 26-13 road, 19-20 ATS road NO: 33-48, 37-43-1 ATS, 19-21 home, 17-23 ATS home __Spread:__ Warriors -9.5 __Total:__ 235.5 __Moneyline:__ Warriors -475, Pelicans +380 __Betting tip:__ The Warriors have the No. 1 seed in the West locked up and have been busting bankrolls all season, so lay these points at your own peril. ### Suns at Mavs odds, 7:30 p.m. PHX: 19-62, 36-45 ATS, 7-33 road, 18-22 ATS road DAL: 32-48, 44-35-1 ATS, 23-17 SU and ATS home __Spread:__ Mavs -7.5 __Total:__ 223 __Moneyline:__ Mavs -330, Suns +270 __Betting tip:__ Six of the Suns' last seven have gone OVER. Dallas is 0-6-1 ATS in their last seven homes games vs. a team with a losing record. ### Nuggets at Jazz odds, 8 p.m. DEN: 53-27, 42-38 ATS, 20-20 road, 17-23 ATS road UTA: 49-31, 42-36-2 ATS, 28-12 home, 20-19-1 ATS home __Spread:__ Jazz -2.5 __Total:__ 214.5 __Moneyline:__ Jazz -145, Nuggets +125 __Betting tip:__ Five of the Nuggets' last six against teams with winning records have stayed UNDER. The bet has also hit in four straight Jazz games after a SU loss. ### Blazers at Lakers odds, 9:30 p.m. POR: 51-29, 44-35-1 ATS, 20-20 road, 21-19 ATS road LAL: 37-44, 34-46-1 ATS, 22-18 home, 16-23-1 ATS home __Spread:__ Blazers -9.5 __Total:__ 224.5 __Moneyline:__ Blazers -450, Lakers +370 __Betting tip:__ LeBron James is out, of course, while Portland seals the No. 4 seed with a win and has an outside shot at No. 3. __ALSO:__ [Lakers next coach odds](https://www.betchicago.com/lakers-next-coach-prop-bet-luke-walton-fired) __PLAY:__ Our free [Daily NBA Pick 5 game](https://betchicago.chalkline.com/games/nba-pick-5). Pick five select NBA games ATS to win a BetChicago prize pack.